The Week in HD - Monday 11th November | What Hi-Fi? In anyone else's hands, this would be a by-the-numbers Transformers-style merchandise-generating blockbuster. But in the trusty and imaginative hands of director Guillermo Del Toro, this robots vs monters film is a whole different beast – and it's just plain fun. 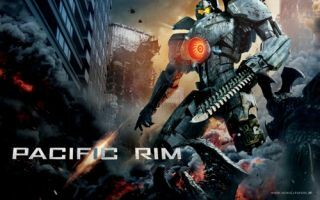 Giant Lovecraftian monsters called Kaijus rise from the depths of the sea to wreck havoc on Earth, and the government's response is to build human-controlled giant mecha-robots called Jaegers. Which punch the Kaijus to death. It's bonkers and utterly glorious, with jaw-dropping character design and battle scenes. Awesome in every sense of the word. The colours are gorgeous, the storyline is simple but effective, and we'd go into battle on Idris Elba's command any day. This might just become our new favourite test disc. Ban Luhrmann is the perfect director to take on this great American novel by F. Scott Fitzgerald. His trademark dazzling and extravagant style beautifully depicts the fast and carefree lifestyles of the nouveau riche in 1920s New York – the sets and costumes are simply gorgeous. The casting is perfect, too: Carey Mulligan is the flighty Daisy Buchanan, Tobey Maguire is the naive Nick Carraway, and Leonardo DiCaprio is the enigmatic Mr Gatsby. A much anticipated prequel that falls just short of the magic and charm of the original Monsters, Inc. film. Still, this is Pixar operating at full power, so get ready for some stunning animation, colourful characters, great in-jokes, and some sparks of nostalgia as we revisit Mike and Sulley in their university years. A new week brings us eight new contestants who must impress Monica and Gregg with their cooking. First up is the Invention Test, where they have to create a dish out of the seven main ingredients of sardines, camembert, endive, cucumber, Cape gooseberries, pistachios and pomegranate. Four hopefuls take part in the dreaded Skills Test, where they must skin and cook a dover sole to perfection in under 12 minutes. Then in the Classics challenge, Michel Roux Jr expects them to cook roast saddle of hare with red wine and mustard sauce. To perfection. Poison Pen. A mysterious poisoning bears a startling resemblance to Holmes's first-ever case, and leads to a reconnection with an old friend. But are the two incidents linked? Another four contestants, another round of the Skills Test. This time, they have to cook potato gnocchi with any sauce or garnish of their choice. Meanwhile, in the Classics challenge, the hopefuls must bring all their classic training to the table to deliver roast John Dory with artichoke barigoule. It's Doctor Who's 50th anniversary this month, so be prepared for a barrage of Who-related shows. We start with Professor Brian Cox meeting Matt Smith's 11th Doctor. Prof Cox inexplicably turns down a spin in the TARDIS in favour of giving a lecture, but he does then delve into the science behind the show's wibbly-wobbly timey-wimey… stuff. Such as: will time travel be possible in the near future? Do extra-terrestrials exist in distant planets and galaxies? And how exactly do you go about building your very own TARDIS? The Doctor Who Special. Yes, it's an old one, but we can't ever pass on this hilarious episode when the 10th Time Lord David Tennant guest hosted this Doctor Who-filled musical episode. Catherine Tate is utterly bonkers as she confuses Kate Bush with Robin Hood; Jo Whiley insists she should've been the next companion; and the wonderful Bernard Cribbins makes Noel Fielding look mainstream. OK. An ex-hitman is injected with a drug that's programmed to kill him if his heart rate drops below a certain level. How does he keep his adrenaline pumping? Exercise? Nah. Scary movie? Nope. Commit robberies, get into gang fights, and generally engage in violent behaviour? Yep, that'll do it. Sir Terry Wogan and friends start off the night's fundraising and entertainment. The Hub. After last week's emotional episode, we head into the dark underbelly of the S.H.I.E.L.D. organisation. The unusual pairing of Ward and Fitz is deployed on a Level 8 assignment – but it quickly becomes clear that they've been sent on a dangerous suicide mission. Goblin Merchant Men. This adaptation of Dracula takes a different turn from the rest, with the legendary vampire working with his long-time nemesis Abraham Van Helsing. They're quite chummy. Van Helsing is even cooking up an anti-sun lotion for him. Confession time: I only just realised a couple of weeks ago that I had never seen Die Hard. While I vaguely remember Alan Rickman not looking like Professor Snape, I hadn't seen the first film from start to finish. To redeem myself: I have seen Die Hard 2. Natalie Portman plays a highly strung, perfectionist ballerina who is determined to land the starring role in Swan Lake. But the pressures of the role and the threat from a rival start to take on a dark and disturbing toll on her mind, and she soon loses control over reality as she throws herself into the character. No, not really. He's a hitman who is ordered to kill his master, and then takes the dead man's son under his wing as an apprentice. There will be punching, there will be vengeance, and there will be one-liners. Excellent.